Although I grew up mostly in England, I have lived in Appalachia for over 15 years now. I’ve raised my daughter here, and my father and his family and their ancestors are from here. Strangely, though, as my love for photography and landscapes across the world has grown and flourished, my connection to Appalachian lands has remained tenuous, shifting, uncomfortable. Fear and uncertainty often characterize my solo experiences in these forests and mountains. Spring and summer’s lush green chaos blankets the subtleties I seek. Gentle moments and elegant, refined scenes remain hidden. I find it hard to see. 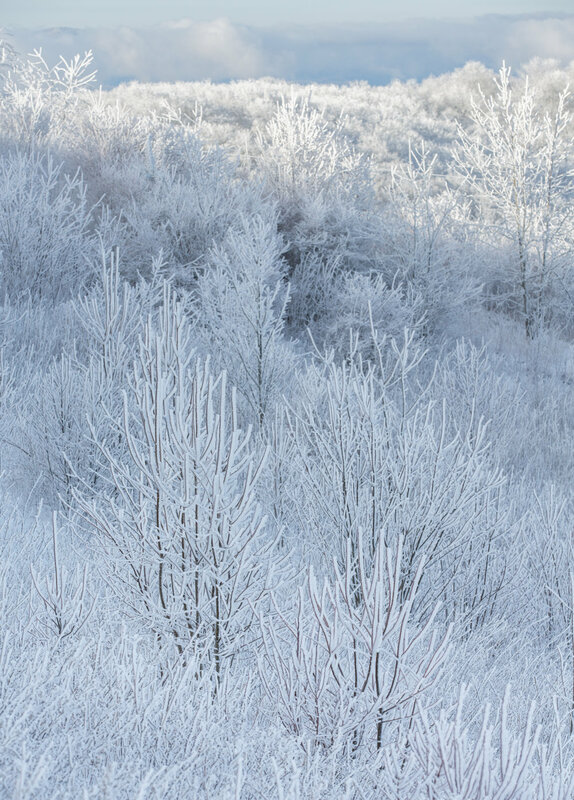 But winter is different… For many, it is a bare, bleak time of the year, a season to dread, to tolerate. 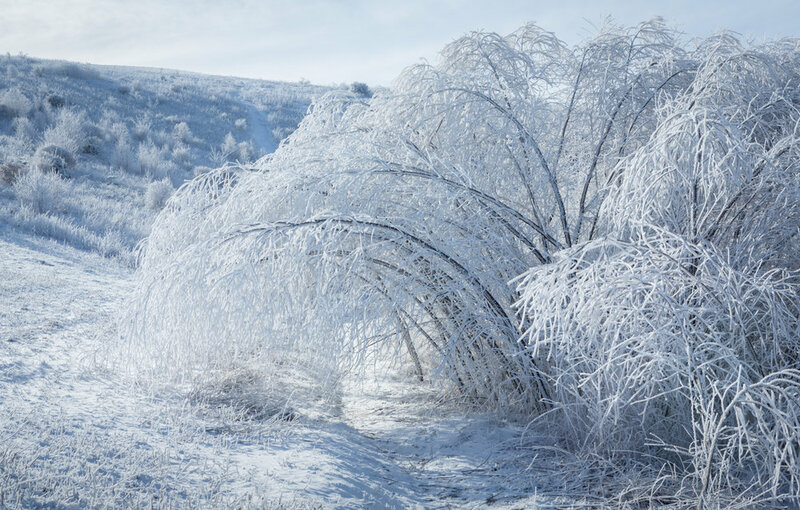 But for some, such as the narrator in Wallace Stevens’s “The Snow Man,” it is a time to see clearly, to regard and behold the land, to find clarity and simplicity, wonder and beauty there. 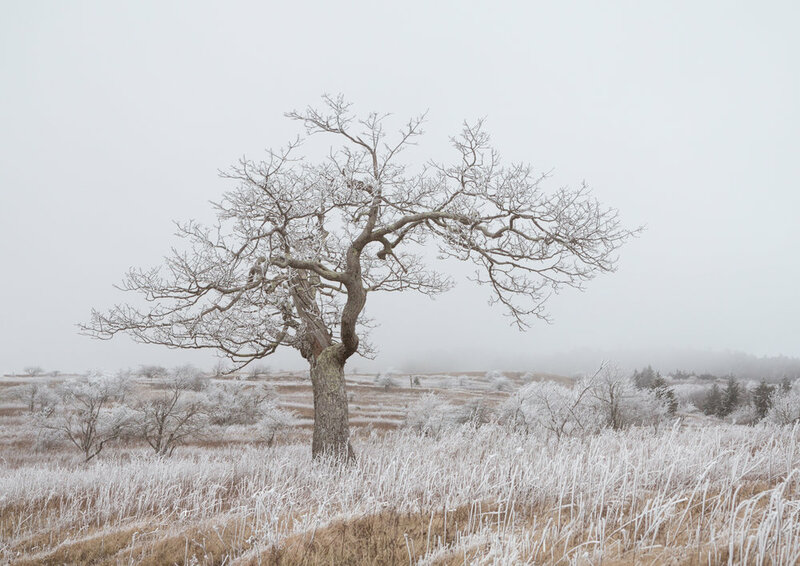 For those willing to set aside negative emotions and expectations, winter can cast a clear light on the land, unburdened by our inner narrative. Winter can illuminate. 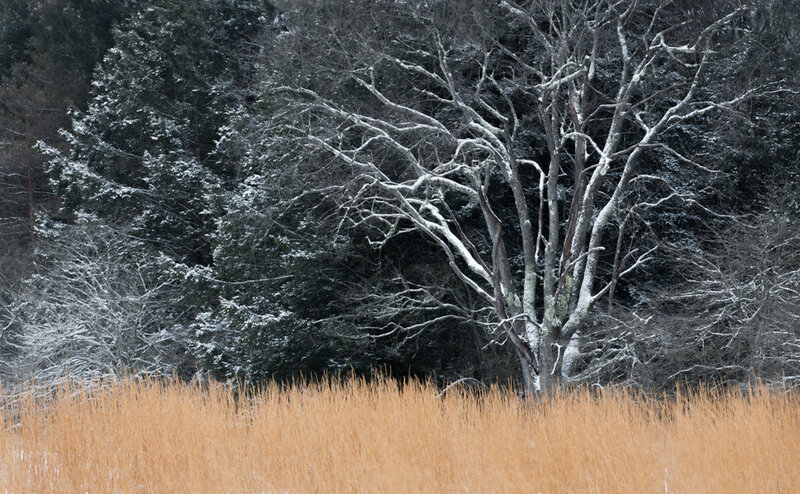 In my series “The Frost and the Boughs,” I explore the winter landscapes of the Appalachian mountains and forests. Ice, frost and snow lighten and brighten, fog simplifies. Pale blues dominate, sometimes punctuated with the warm golden glow of the sun or the faded yellows and oranges of grasses left over from seasons before. Rhythm and pattern reveal themselves. In these scenes, I find what I seek. I hear the quiet. I see the sparkle. I feel the delicious cold.